Western Blot: H1F0 Antibody (SD206-04) [NBP2-67752] - Analysis of Histone H1.0 on human lung lysates using anti-Histone H1.0 antibody at 1/1,000 dilution. 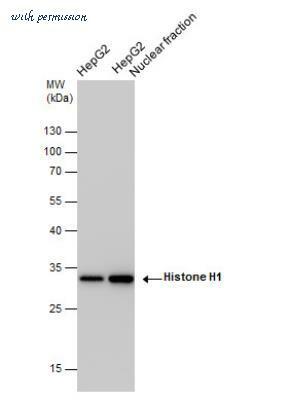 Western Blot: H1F0 Antibody [NBP2-16772] - HepG2 whole cell extracts and nuclear extracts (30 ug) were separated by 12% SDS-PAGE, and the membrane was blotted with Histone H1 antibody (NBP2-16772) at a dilution of 1:10000 and developed with Trident Sharp-ECL. 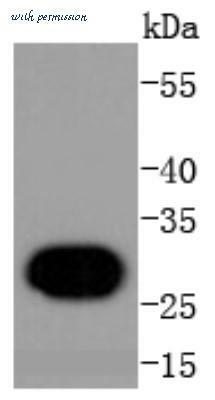 The Histone H1.0 antibody from Proteintech is a rabbit polyclonal antibody to a fusion protein of human Histone H1.0. This antibody recognizes human,mouse,rat antigen. 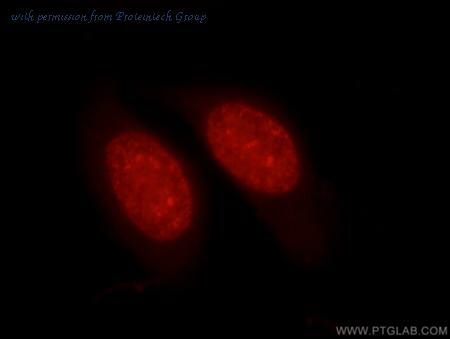 The Histone H1.0 antibody has been validated for the following applications: ELISA, WB, IF, IP analysis.